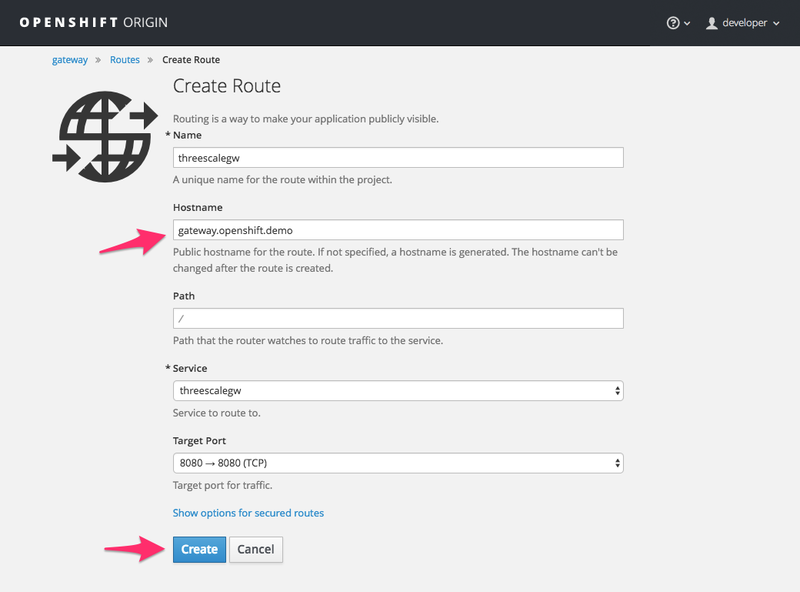 This tutorial describes how to deploy the APIcast API Gateway on Red Hat OpenShift. To follow the tutorial steps below, you will first need to configure APIcast in your 3scale Admin Portal as per the APIcast Overview. Make sure Self-managed Gateway is selected as the deployment option in the integration settings. You should have both Staging and Production environment configured to proceed. If you already have a running OpenShift cluster, you can skip this step. Otherwise, continue reading. For production deployments you can follow the instructions for OpenShift installation. Docker-formatted container images provided by Red Hat are released as part of the Extras channel in RHEL. To enable additional repositories, you can use either the Subscription Manager, or yum config manager. See the RHEL product documentation for details. Find and enable the *-extras repository. Download the latest stable release of the client tools (openshift-origin-client-tools-VERSION-linux-64bit.tar.gz) from OpenShift releases page, and place the Linux oc binary extracted from the archive in your PATH. Please be aware that the oc cluster set of commands are only available in the 1.3+ or newer releases. the docker command runs as the root user, so you will need to run any oc or docker commands with root privileges. Note the IP address that is assigned to your OpenShift server. You will refer to it in the tutorial as OPENSHIFT-SERVER-IP. If you are deploying the OpenShift cluster on a remote server, you will need to explicitly specify a public hostname and a routing suffix on starting the cluster, so that you will be able to access the OpenShift web console remotely. where ec2-54-321-67-89.compute-1.amazonaws.com is the Public Domain, and 54.321.67.89 is the IP of the instance. You will then be able to access the OpenShift web console at https://ec2-54-321-67-89.compute-1.amazonaws.com:8443. By default you are logged in as developer and can proceed to the next step. You should see Login successful. in the output. oc new-project "3scalegateway" --display-name="gateway" --description="3scale gateway demo"
Now using project "3scalegateway" on server "https://172.30.0.112:8443". Ignore the suggested next steps in the text output at the command prompt and proceed to the next step below. Create a new secret to reference your project by replacing <access_token> and <domain> with your own credentials. See below for more information about the <access_token> and <domain>. Here <access_token> is an Access Token (not a Service Token) for the 3scale Account Management API, and <domain>-admin.3scale.net is the URL of your 3scale Admin Portal. Use the value specified in --public-hostname instead of OPENSHIFT-SERVER-IP if you started OpenShift cluster on a remote server. You may receive a warning about an untrusted web-site. This is expected, as you are trying to access the web console through secure protocol, without having configured a valid certificate. While you should avoid this in production environment, for this test setup you can go ahead and create an exception for this address. Log in using the developer credentials created or obtained in the Setup OpenShift section above. You will see a list of projects, including the gateway project you created from the command line above. If you do not see your gateway project, you probably created it with a different user and will need to assign the policy role to to this user. Click on the gateway link and you will see the Overview tab. OpenShift downloaded the code for APIcast and started the deployment. You may see the message Deployment #1 running when the deployment is in progress. When the build completes, the UI will refresh and show two instances of APIcast ( 2 pods ) that have been started by OpenShift, as defined in the template. 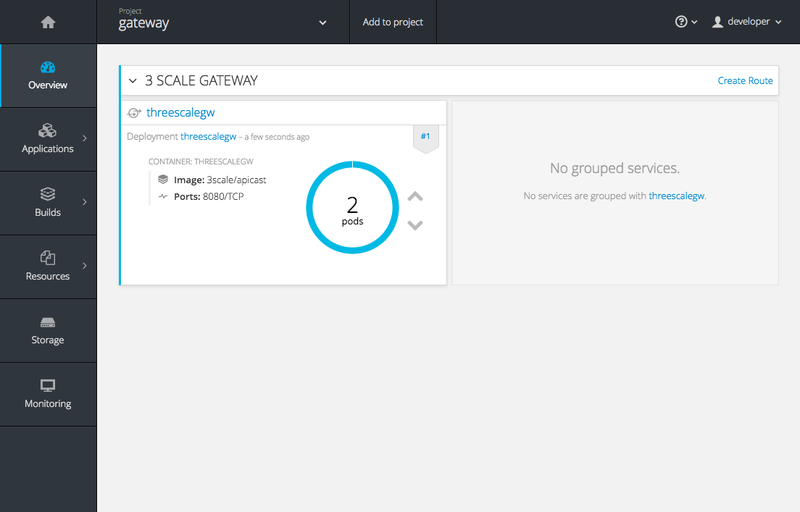 Each APIcast instance, upon starting, downloads the required configuration from 3scale using the settings you provided on the Integration page of your 3scale Admin Portal. OpenShift will maintain two APIcast instances and monitor the health of both; any unhealthy APIcast instance will automatically be replaced with a new one. To allow your APIcast instances to receive traffic, you need to create a route. Start by clicking on Create Route. Enter the same host you set in 3scale above in the section Public Base URL (without the http:// and without the port) , e.g. 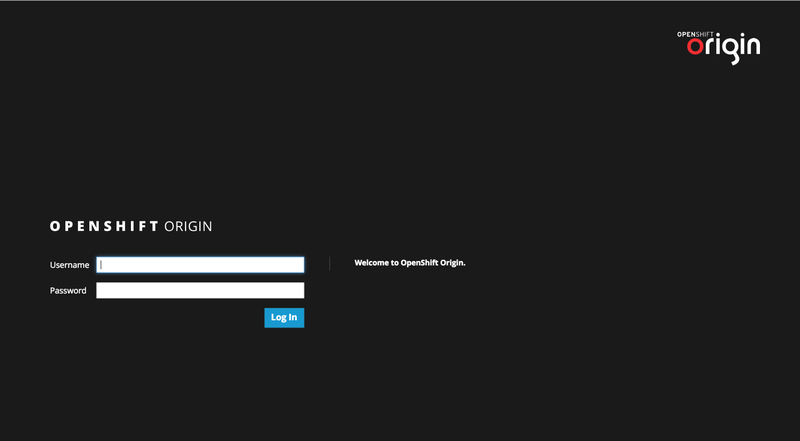 gateway.openshift.demo, then click the Create button. For every 3scale service you define, you must create a new route. Alternatively, you can configure the APIcast wildcard router to avoid creating a new route for every 3scale service you define.